The bathroom: That magical and private space where the body’s most intimate needs are met. That denizen of the necessary. That sanctuary of modern life. It’s been but a mere 100 years since the flushing toilet made its way into the inner sanctum of the private home, and when, finally, the rigors of getting clean via a chilly washbasin were supplanted by that sumptuous haven of relaxation called the bathtub, the concept of the contemporary bathroom was born. The bathrooming ways of our forebears have, for the most part, gone the way of the dodo, and the current cushy state of affairs in which we find ourselves exists thanks to a multitude of under-sung technological achievements. The invention of a soap mild enough to be used on skin, city sewers with trustworthy pipes, that S-shaped bend in the back of a commode, even toilet paper—these advancements and others like them have changed the developed world’s experiences of the human body. These days, the bathroom is one of the most popular rooms in the house, and as technology continues to transform and enhance our experience of it, it’s no wonder. From programmable steam showers to motion detectors that heat toilet seats just before use, the bathroom’s many surfaces and services have never been so comfortable or customizable. Here is a closer look at some of the most appealing and surprising technologies currently transforming a local water closet near you. It wasn’t too long ago that the experience of a hot, straightforward shower could feel like a retreat into the lap of luxury. Steaming water that falls in a massaging cascade over your head and entire body—all at the simple touch of a tap? Cleopatra’s most decadent leanings could neither compare nor compete, and from a technological perspective, the hot shower was just a warm-up routine. 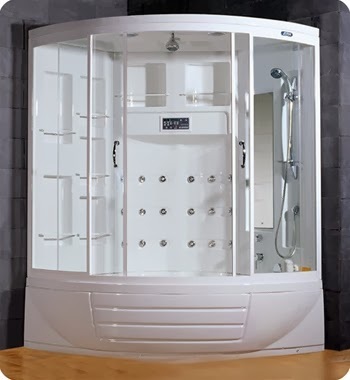 Today, the fully programmable and customizable steam shower beckons, a lavish cleansing option that acts as spa, bathing device and healer. It’s as if there were a shower arms race underway whose only goal was to probe the farthest reaches of a shower design that might feel too good, get too personalized or benefit your health too much. 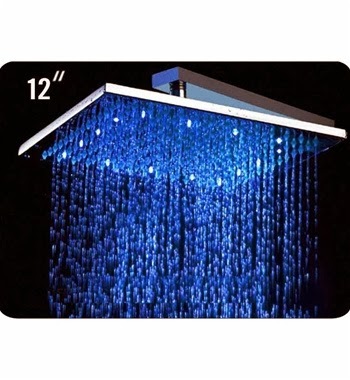 Controlled by a wall-mounted, waterproof, digital platform that responds immediately to any passing whim, as many as a dozen steam heads can be activated, filling your shower with a hot vapor that never gets above a safe 118 degrees Fahrenheit. Control the temperature, the jets in the whirlpool bath, the stream of water falling from multiple showerheads and your choice of music. Relax, rejuvenate, revitalize your aching muscles, clear your sinuses, open your pores and release toxins. If you want to experience easily achieved bodily delight, consider a steam shower. It’s something much more akin to going to a health spa than it is to undergoing a daily cleaning regimen. The best part? When you have a digital steam shower, they’re one and the same. Have you ever wished your toilet seat would warm itself to a temperature of 80 degrees when you approached so that you never had to sit down on a chilly seat again? How about an integrated bidet with a programmable water stream—self-cleaning, of course—and air dryer? Would you like it to conserve water, come outfitted with Bluetooth compatibility, raise and lower the seat for you and play your theme song? Well, why didn’t you say so? It turns out that we may very well be in the Golden Age of Toilets. If you don’t mind spending the money, it’s actually possible to use the bathroom and have expended no more energy than what was required for you to sit down and stand back up. The toilet can, literally, do everything else for you, and it can do so according to your exact specifications regarding temperature, timing and cleanliness. Toto’s bells and whistles are much more than sufficient, and for the environmentally minded, it is arguably the greenest smart toilet on the market as well. Not only is its flushing technology more efficient and robust than most, but its SanaGloss glaze resists debris and bacteria so effectively that less time and chemicals need to be employed in keeping it clean. If you like the toilet you already have, and you don’t want to go the route of buying and installing an entirely new one, you could always just upgrade the one (or ones) you’re already using by adding a high-end, high-tech bidet or washlet. 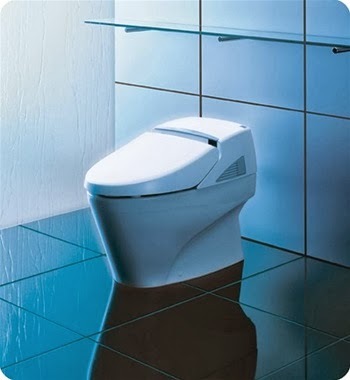 Easy to mount and connect to your existing toilet, bidets like the COCO 9500 offer heated seats, adjustable and programmable water pressure and temperature, an air dryer, soft closing seat, splash guard and deodorizer. Many also come with a wireless remote control. Installing a smart bidet on your existing toilet is an easy and relatively inexpensive upgrade that will make a world of difference in your bathroom experience. It will feel like you’ve found a portal through time and space so that every time you use the bathroom you do so in Europe. In the future. 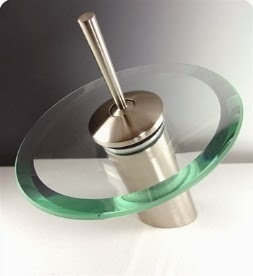 · Fresca’s Waterfall Faucet. Joystick-driven, this faucet invites you to consider yourself a player in a solo waterfall game of hand washing. This slick, contemporary design utilizes a smooth metal joystick to control flow and temperature, while the disc that surrounds it sends a pleasing cascade of falling water down onto your hands. · Toto’s EcoPower. Hands-free and beautifully crafted, these bathroom faucets have a self-setting detection range and programmable low-flow cycles that conserve water. They’re also powered sustainably: The flowing water turns high-efficiency turbines that create and store all the energy the faucet needs to keep working. · Lights, Faucets, Action! To appreciate the full range of pragmatic and decorative lighting available in the land of high-tech faucets, you’d have to travel the globe. LED displays turn faucets, showerheads and water streams blue or red depending on the temperature of the water running through them, and some touch screens glow in variances that cross the visual spectrum so users can pick their ideal hand washing temperature based on color and hue. · Dyson Airblade Tap. While it looks like a submarine periscope, the Dyson Airblade Tap faucet’s spectacular achievements all take place above the surface. It doesn’t just wash your hands, it dries them, and it does so in 14 seconds with a 400-mile per hour blast of air that travels through an internal HEPA filter in order to block bacteria from rocketing its way back onto your skin. Completely hands-free, this faucet and dryer have built-in sensors that locate your hands before washing or drying them. Television has been a ubiquitous presence in American homes since Leave It to Beaver hit the airwaves in 1957, but its integrated presence in the bathroom is relatively new. Just how integrated is it now? Completely. Would you like to settle into a bath with a bevy of body-massaging whirlpooling jets and the comfort of not just watching your favorite television show, but also knowing that your close and wet proximity to the screen won’t cause it—or you—any damage? 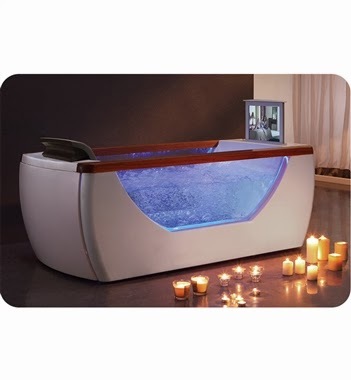 EAGO makes a deep and comfortable freestanding whirlpool tub with a built-in, retractable, water-resistant television screen, digital surround sound and variable LED lighting. Movies, TV, the radio, your smart phone’s music library—whatever you want to listen to or watch can now be easily incorporated into your bathing experience. For a medicine cabinet mirror that doubles as a television, there are offerings such as the Robern M Series TViD. Located in the bottom right corner of the mirror so you can have a clear view of yourself while you shave, pluck your eyebrows or practice a speech, the television and built-in speakers allow to get in an early dose of news or a self-indulgent rerun of Friends before you begin your day. And if you’ve always wanted to watch the shower scene from Psycho while taking a shower of your own, Seura’s Hydra Waterproof Television can make that dream an uncomfortable reality. This 19-inch, HD, LCD television can be completely mounted into your shower wall so you never have to miss a game, news, movie or episode of Dr. Who again. It would be highly remiss of today’s bathroom innovators if they addressed heated toilet seats and programmable shower experiences but failed to provide a way to warm towels beyond popping them in the dryer. Thankfully, even this minute detail has not been overlooked. 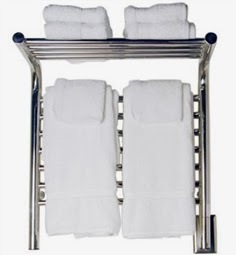 Wall-mounted warming racks like those so stylishly designed by Amba are an easily added bathroom accessory, and the hidden luxury of a hydronic warming drawer can quick-heat your towel or robe in just five minutes flat. While it’s far from being a necessity, wrapping yourself in a hot towel after a bath or shower at the end of a long day is the bathroom equivalent of Goldilocks finally sitting down to a bowl of Baby Bear’s porridge. It really is just right. 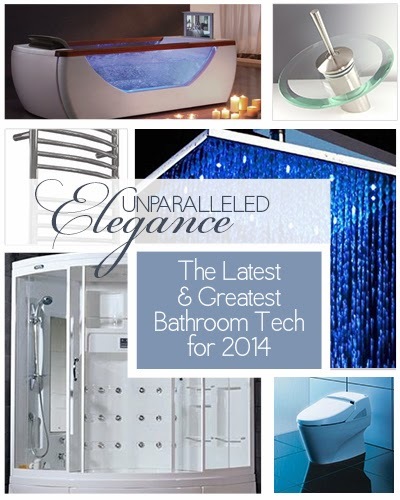 It doesn’t really matter whether you prefer your bathroom’s technology to be flashy or genteel. Unless you’re a self-avowed Luddite, technology exists that either has changed or will change your bathroom experience in remarkable ways. While it’s hard to imagine anything usurping the importance of the flush toilet or a bar of soap, today’s bathrooms and the minds that seek to improve them are sparing not an ounce of ingenuity as they carve up new possibilities of reality one showerhead at a time.